BREAKING NEWS - New packet pickup added - come join us at Road Runner Sports in Falls Church on Friday May 18 from 4 pm - 8 pm! See packet pickup section for details! This 5k Race / Fun Run winds through the Greenbriar Community in Fairfax, VA, with a start & finish behind the Total Wine & More in the Greenbriar Shopping Center. Immediately following the race is an all day party at Dogfish Head Ale House (just across the parking lot from the Start/Finish Line). 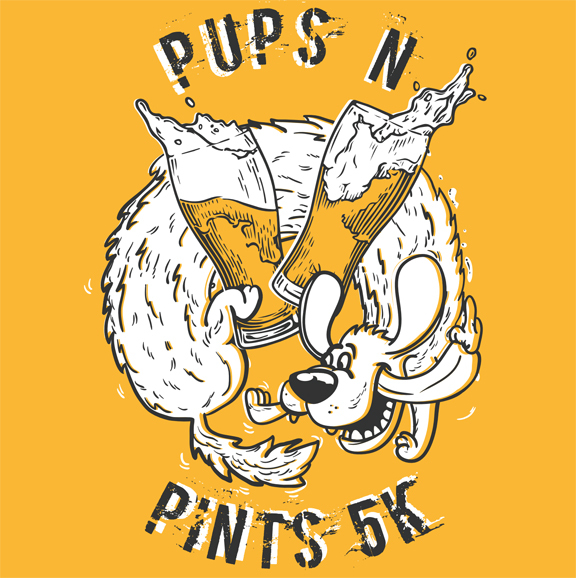 Each race participant will receive a super-soft race t-shirt, a FREE BEER after the race (for participants over 21), and access to the post race party including live music by Internal Frontier. The party will continue all day until Dogfish closes at 10 pm and Dogfish will generously donate 10% of their proceeds to HART. The day will also feature raffles and games. We will also be selling limited edition event TShirts (not the same as the shirts race participants get!). Register now - we sold out last year! I know that running a road race is a potentially hazardous activity, which could cause injury or death. I will not enter and participate in this race unless I am medically able and properly trained, and by my signature, I certify that I am medically able to perform this event, and am in good health, and I am properly trained. I agree to abide by any decision of a race official relative to any aspect of my participation in this event, including the right of any official to deny or suspend my participation for any reason whatsoever. I attest that I have read the rules of the race and agree to abide by them. I assume all risks associated with running in this event, including but not limited to: falls, contact with other participants, the effects of the weather, including high heat and/or humidity, traffic and the conditions of the road, all such risks being known and appreciated by me. I will abide by all race rules. Having read this waiver and knowing these facts and in consideration of your accepting my entry, I, for myself and anyone entitled to act on my behalf, waive and release the Pups N Pints 5K, the county of Fairfax, and the Homeless Animals Rescue Team, all event sponsors, their representatives and successors from all claims or liabilities of any kind arising out of my participation in this event, even though that liability may arise out of negligence or carelessness on the part of the event sponsors named in this waiver. I grant permission to all of the foregoing to use my photographs, motion pictures, recordings or any other record of this event for any business purpose.